Have you tried some of them? What are their advantages and drawbacks? NOTE 2: I will post some possibilities I am aware of in the answers. But I would be grateful if someone who tried these applications could expand these answers a little more. It is possible to copy the text of session (simply by selecting it) and put it into a TeX file. 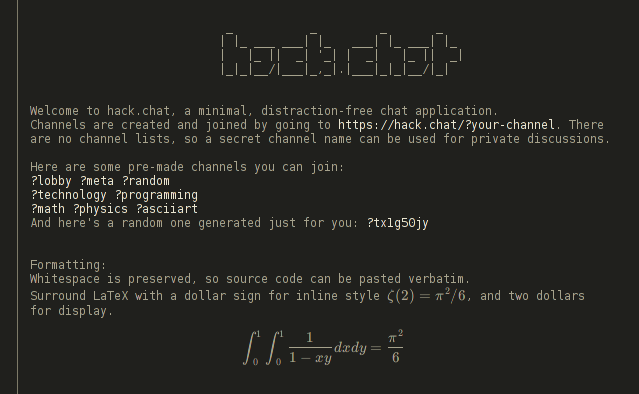 The web interface of hack.chat renders LaTeX, and there are some pre-made rooms for math, physics, etc. It's also open source and can be installed on your own server if needed. You have to replace spaces with %20 since spaces are not allowed in URLs (actually, it is probably best to escape all reserved characters in URLs, but other than spaces, most characters seem to be passed through by a number of common browsers). $1:$ You will only be able to view this on desktop, mobile does not support it yet. $3:$ There is a one-line size limit which isn't terribly generous. $4:$ If KaTeX can't parse the math, it will stay unrendered text, but you can hover over it to see the error message. So, a bit restricted, but there's a lot of potential, and the future is now. But yeah, again sorry for mentioning it on such an old message, but I think it's worth letting people know. EDIT: This project seems to be abandoned. (At least the website does not work anymore.) If anyone has the knowledge that it has been moved to another location, please, edit this post with updated information. 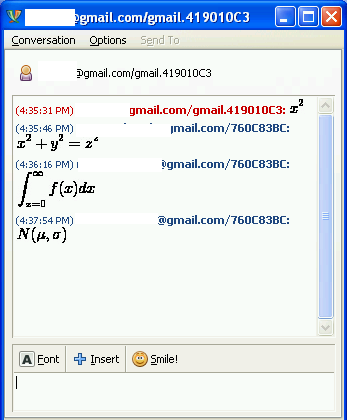 TeXChat is a chat which uses Mathjax for rendering math. I've learned about it from the website MathJax in Use. You can copy a source of an individual message by hovering above it and selecting the text. 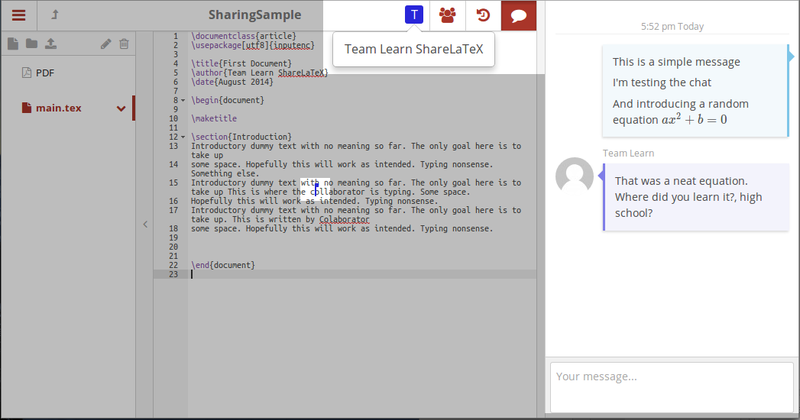 As almost all of ShareLaTeX, it's open source [backend, frontend]. 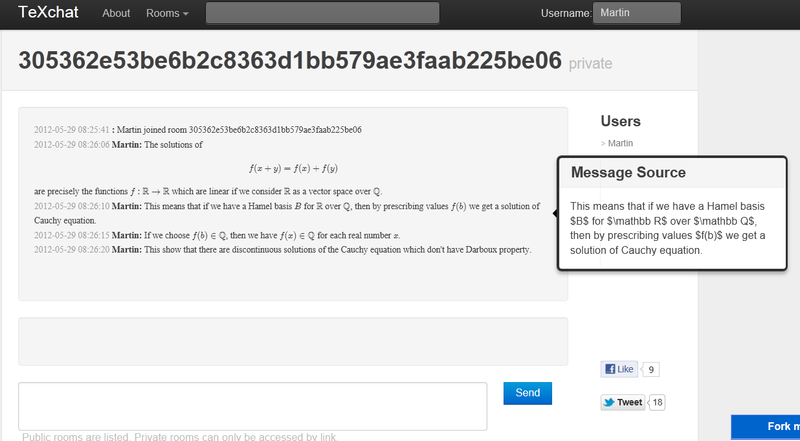 Overleaf has not exactly chat but inline commenting with replies — currently doesn't render math in comments. There are scripts written by Valery Alexeev. GmailTeX was mentioned in leo's comment. There is also GmailChatTeX. This Firefox add-on http://thewe.net/tex/ seems to be similar. Foo `a^2 + b^2 = c^2` bar baz. Unfortunately there is no text tool to add formulas inside the drawing area, and the chat is a small subwindow in the corner. KaTeX-powered so supports less constructs (e.g. no matrices). Free public and private rooms up to 25 people. I use Lyx to type LaTeX quickly. It is a WYSIWYG LaTeX editor. You can then use screen sharing e.g with Skype so the other person can see what you are doing on Lyx. Never tried the screen sharing part, just an idea. If you want a wide platform support, including smartphones and want a mainstream messenger lots of people already use, then telegram with a latex bot can do this. If you are not familiar with telegram, it's basically like whatsapp. 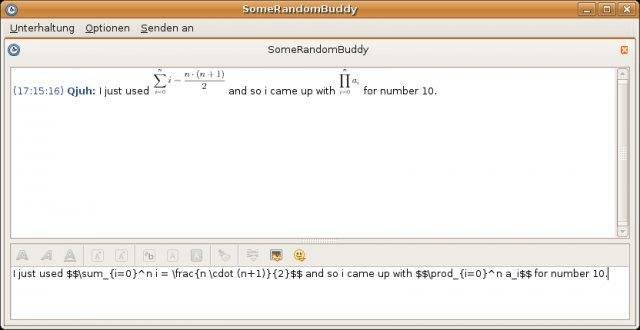 It might not be as feature reach and perfect as latex plugins for jabber clients, for example, it is not capable of inline math, it just gives you an image with your formula in chat. If you need LaTeX only occasionally, this is ok. However, I believe telegram is the only mainstream messenger that can do LaTeX and it is also available for all major platforms including mobile. It also has a superfast synchronization between your devices via cloud (yes, you can store your history on the server). How to organize math study groups online for long-distance collaboration? What is a good communication platform, which supports something like TeX-code? Is it a good approach to heavily depend on visualization to learn math? Insightful educational games about mathematics? What's there to do in logic?